Partial Knee Replacement, unlike its conventional counterpart, is typically performed on a knee where damage to the joint cartilage is essentially limited to only one “compartment”. This procedure can be a very valuable surgical option in instances where the patient may be a bit younger, more active and, since the cartilage damage is confined to only one joint compartment, there is no need to completely remove otherwise healthy joint surfaces. The Partial Knee Replacement procedure involves the re-surfacing of one of the femoral condyles, or “knuckles” of the thigh bone and one side of the tibial surface (shin bone side). The two metallic implants are separated by a plastic spacer much the same as seen in the Total Knee Replacement version. The patella (kneecap) is left alone and not re-surfaced. The procedure has been around for many years and, up until recently, has traditionally met with less than desirable results. Either they didn’t “work well”, caused continued pain, or became loose and required conversion, or revision, to the formal Total Knee Replacement procedure. That said, however, Implant re-designs and enhancements, together with better technical knowledge, surgical techniques and skill levels, have once again made this type of procedure a critical option in the Orthopaedic Surgeon’s surgical armamentarium. There are basically two types of Partial Knee Replacements; first, is the “fixed-bearing” implant, where the plastic spacer between the femoral and tibial components is snapped into place and does not move independently. The rounded femoral component comes into contact with the spacer as it rotates through flexion (bending) and extension (straightening) of the knee. The second type, as seen in the image below, is called the Mobile Bearing Implant. 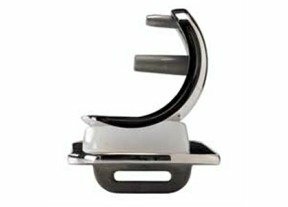 This style of implant boasts a plastic spacer which is capable of not only maintaining proper contact with the round femoral component during knee motion, it also moves independently around its base. The plastic polyethylene tibial implant, or "spacer", typically "slides" from front to back on its metal base during knee range of motion which allows for more smooth movement between the parts. This results in less wear on the plastic component, which is where the "mobile bearing" terminology came into being. Up until recently, uni-compartmental, or partial, replacement procedures were more or less limited to the inner, or medial, joint compartments. Technology advancements as of late have resulted in the development of a more suitable implant for the lateral, or outside joint compartment. The intended benefits to this particular style includes longer life of the spacer, less overall wear and tear which can result in less chance for the need to revise the implants at some later date years down the road. In many studies there is data to support that these implants continue to function well, in over 94% of patients at 20 years. As you will learn on subsequent pages, this procedure is actually being done in an out-patient setting, with very favorable outcomes. Of the many benefits touted by partial knee replacement, shorter surgery time, less anesthesia, quicker recovery and reduced post operative pain are the most recognized. "Click Here to Find, Compare and Rate Health care Providers"